this award-winning program started in 2005! Tuesdays at 6:30pm starting May 7th in BERKELEY BOOK! Sundays at 11am starting June 2nd in OAKLAND BOOK! Daytime 8 Class Series Mondays and Wednesdays at 11am starting June 3rd in Berkeley BOOK! Whether you’re an amateur or beginner in the kitchen looking to progress beyond boiling water or an advanced home cook wanting to take your cooking to the next level, the 12 Week Basics Series is just right for you. In this cooking program, we go beyond merely teaching you recipes to explore the cooking techniques that are the foundations for all recipes. Understanding what’s “under the hood” of a recipe (what makes it work) helps you pull it off to perfection every time. You’ll learn the basic science and proper cooking methods that will make all cooking a breeze, from quick weeknight family meals to entertaining for a crowd! Who is teaching the series? YOU GET TO WORK WITH ONE PROFESSIONAL CHEF PER 10 STUDENTS. 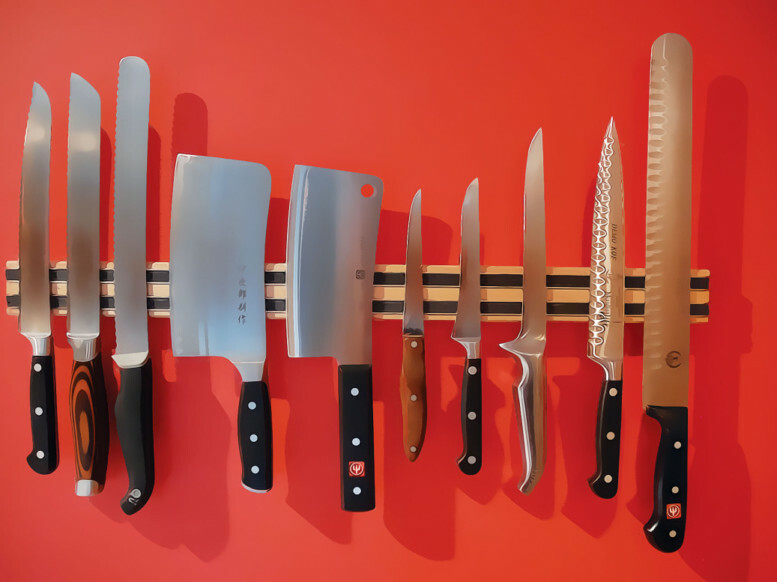 We start your training with basic, essential skills in the kitchen and working with your most important tools – your knives. 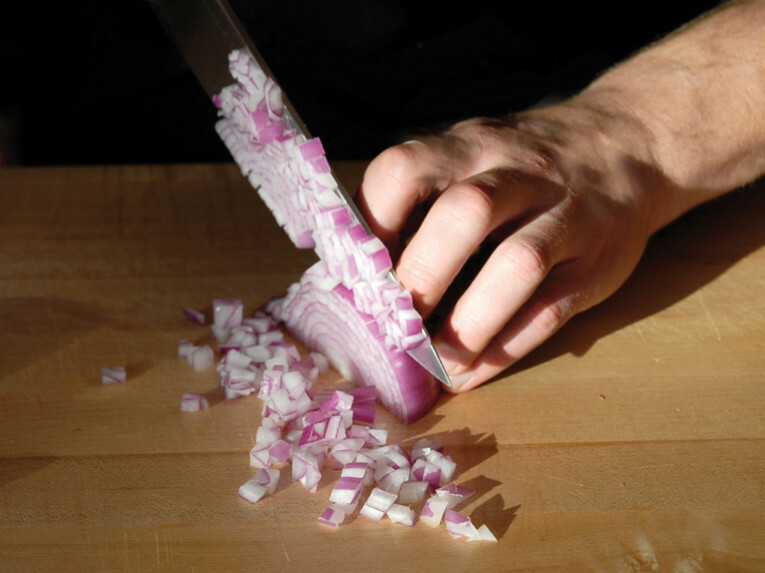 We’ll explore the physics of the knife and cutting techniques such as slice, julienne, mince, dice, and chopping. We demystify sharpening and honing, choosing the right equipment, and how to keep your fingers cut-free forever. You’ll learn about cutting surfaces, setting up a work station, proper prep procedures, keeping food fresh and safe, and the basics of kitchen safety and lingo. Get ready to become the best home chef you can be! It’s time to put our newly-honed knife and kitchen skills to use! In this second class, we’ll cut ingredients for sautéing and stir frying, and break out the woks and sauté pans for a night of stove top fun! While cooking up some exciting international dishes, we’ll explore topics such as choosing the right pans and utensils, oils vs. butter, the inside scoop on non-stick, why to add oil only to a hot pan, and proper procedures for ensuring both proteins and veggies are done to perfection. We’ll even explore how to set your cooking on fire, the safe way, with flambé. Step three in your training: omnipresent stocks and a natural next step to creating delicious soups. 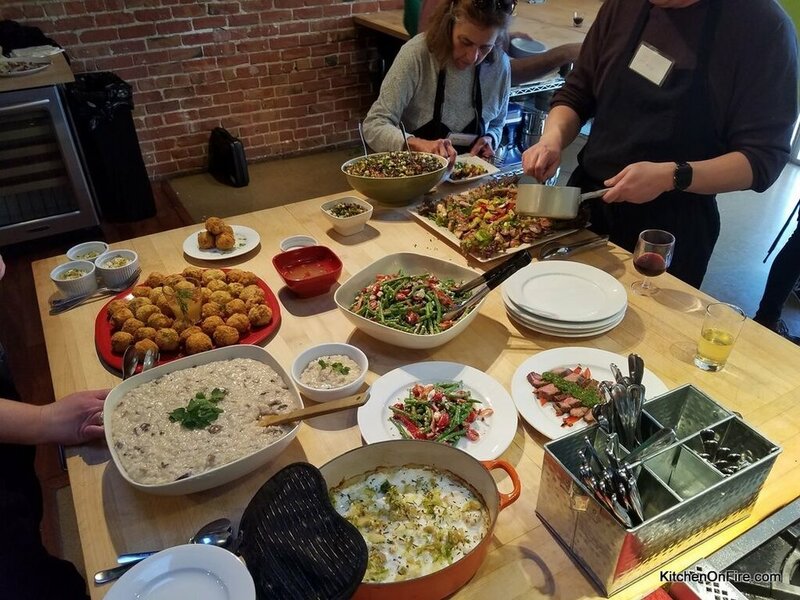 In stocks we’ll explore raw vs. roasted bone, mirepoix, how to get the best flavor and mouth feel, differences in simmers and boiling, sachets, and ingredients to make stocks from around the world (to name a few topics). Our soups will range from beautifully simple, seasonal vegetable purees to delicately-balanced Asian favorites, hearty chowders and creamed soups, and everything in between. We continue our technique of cooking foods either fully or partially submerged in “liquid” with a twist – this time our “liquid” is oil. We’ll check out pan and tool options, discuss oil differences, knowing the right temperatures, proper breading procedures, seasoning methods, and even how to roll an egg roll. 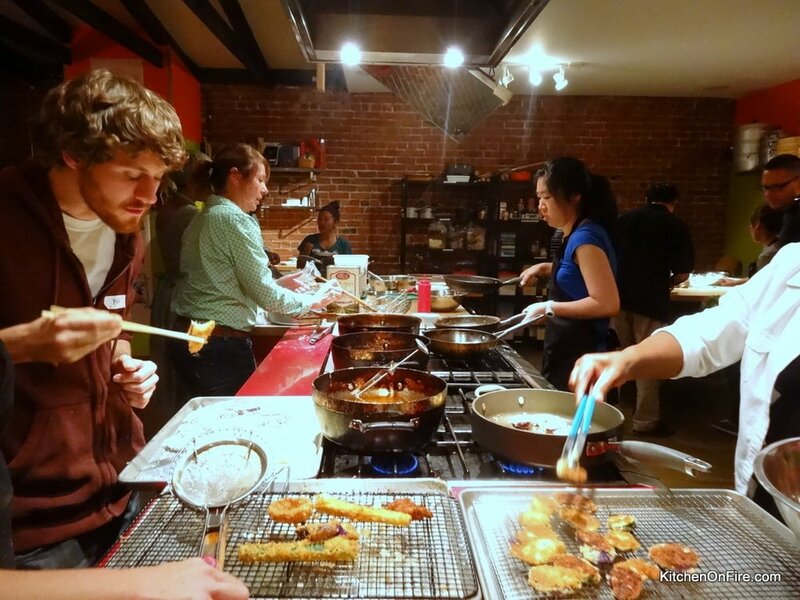 From classic fried chicken to tantalizing tortilla chips, it will be a frying frenzy. 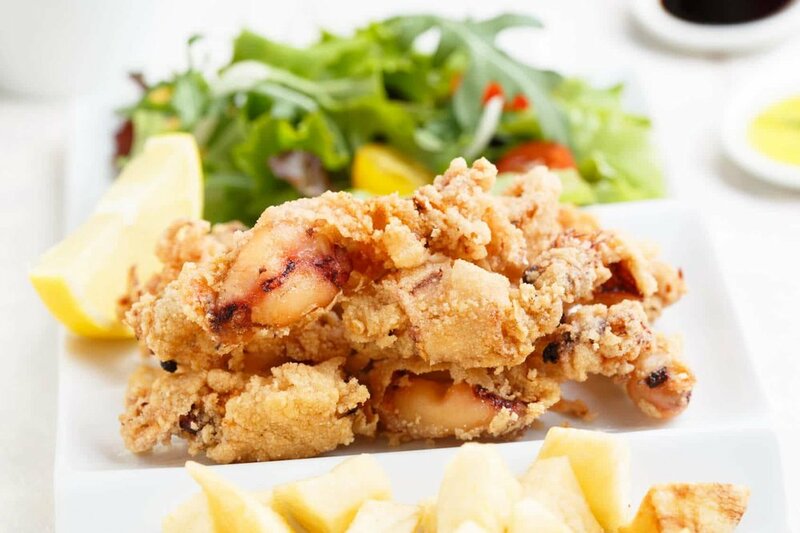 Learn some fantastic international dishes with a perfect crispy crunch! We take cooking with liquids even further this week by submerging tasty proteins and veggies in liquids and slowly cooking them! Learn how to properly brown meat, what pan to pick (and why), what are the best veggies and cuts of meats and fish to use for this style of cooking and how to cook everything to perfectly delicate tenderness. We’ll create delicious stews and braised dishes from around the globe in this flavor-packed class. And speaking of flavor, get ready for French mother sauces and all their international friends. We’ll take our newfound stock expertise to make age-old culinary master sauces. With the base sauces we learn, you will be able to create the complex sauces we all know and love; and we’ll add some new ones to your favorites list! From velvety demi-glace to creamy cheese sauces, spicy BBQ and sweet chili sauces, coulis, pestos, chutneys, salsas, etc. Our palates will be coated with saucy goodness. Say goodbye to lumpy, soupy and tasteless sauces forever. In Week Seven we begin to utilize the oven as our heat source for cooking. This new medium means fun new challenges to explore. We’ll learn about searing, trussing, brining, convection, picking the right tools for the job, determining doneness, and choosing the right oven temperatures. From juicy roasted meats to perfectly broiled fish and deliciously tender vegetables, there will be a whole lot of cooking going on! One of the greatest tools we have for cooking our favorite foods is the grill. Nothing imparts such a wonderful flavor and who can deny the beauty of perfect grill marks?! We’ll explore choosing proper tools, the right way to oil a grill, how to keep meats and fish from sticking, gas vs. charcoal, the difference between direct and indirect grilling, marinades and rubs, wood and herb smoking, and how to get those perfectly crossed grill marks. Get ready to grill everything from fish to fruit! No meal is complete without good, comforting bread. Whether it’s for a sandwich or soaking up the last bits of a delicious sauce, bread has a place as a well-loved staple in our diet. We’ll discover the real deal behind yeasts and bread flours, gluten development, relaxing, proofing, baking stones, kneading, flavor development, shaping doughs, mixers, steaming, convection, choosing the right tools, and how to get beautifully golden brown crusts on the outside and perfect textures on the inside. Nothing says lovin’ like warm bread from the oven! In the second part of our bread extravaganza, we switch our leavening agent from yeast to good old sodium bicarbonate (baking soda) and its jazzed up cousin, baking powder. Quick doughs are an indispensable asset to anyone’s culinary repertoire. We’ll explore topics such as weight vs. volume measurements, the difference between baking soda and baking powder, forming doughs, maintaining moistness, adding flakiness, picking out the right tools and pans, oven management, determining doneness, and how to store baked goods. Round out your bread-baking skills in yet another evening of doughy deliciousness! No proper culinary training would be comprehensive without an exploration of pasta, starches and grains. 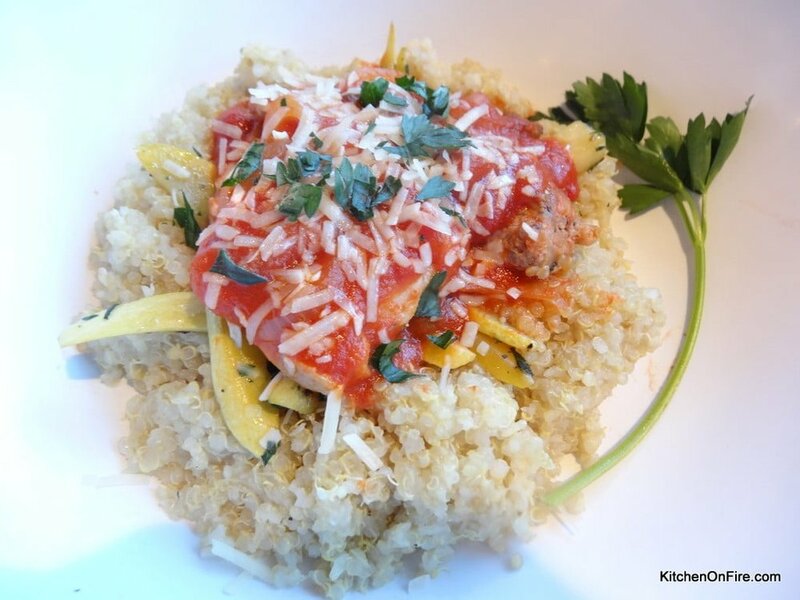 We’ll go beyond pasta and rice to learn about ingredients such as couscous, spelt and quinoa. Our very own nutrition expert Lisa Miller will teach us about how grains affect our bodies and how to make the healthiest choice for you. We’ll learn about properly salting water, making and rolling pasta dough, draining pasta (and keeping it from sticking), dumplings, potato preparations, the difference in rice grain size, types of starches and how to release them, toasting grains and what “al dente” really means. 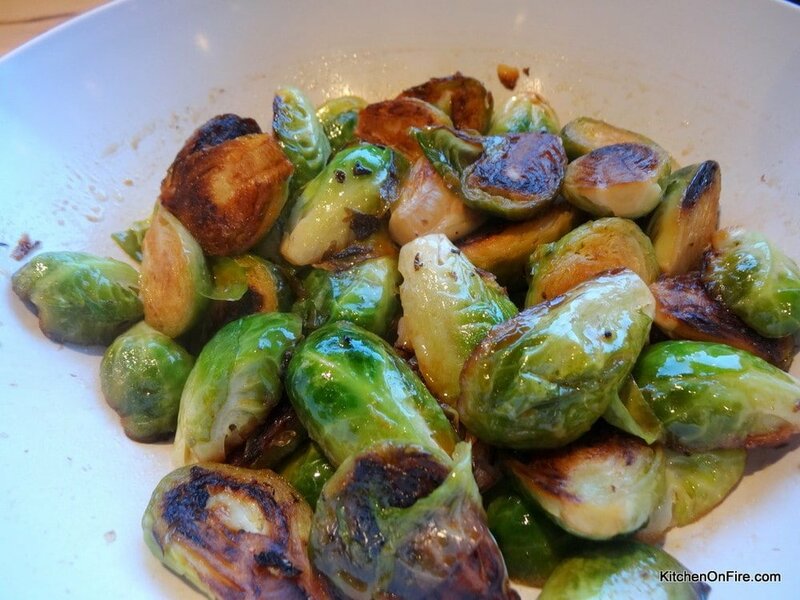 We’ll create delicious recipes that make great sides but can also shine as entrees all their own. Twelve weeks of your journey through the wonderful world of cooking culminate in this exciting celebration of your now well-crafted culinary arsenal. Bring the champagne and get ready for the most exciting team cooking event you’ve experienced. The class is divided into teams and students arrive to baskets of mystery ingredients and an envelope of cash. You and your teammates must shop for additional ingredients across the street and have two hours to create a multi-course meal for your chefs and classmates to enjoy. Your chefs will critique your dishes and provide helpful feedback. Get ready to graduate and show yourself what you’ve got! Lisa Miller and Olivier Said are always present for most of all series. Lisa comes and does 3 lectures about health and basic nutrition. Chef Olive Leads most of the series with chef Mat and Chef Gaby along other chefs. Average of One professional chef instructor for 8-9 students! Culinary background: Chef Lev started cooking at age 15. He graduated from the California Culinary Academy and was Executive Chef at the El Paseo in Mill Valley, Union hotel Benicia, and Devil Mountain Brewery. He owned the Lookout Hotel in Costa Rica and was a Chef Instructor at the California Culinary Academy and Le Cordon Bleu. Biggest influences: World Start foods and abundance of fresh foods in northern California. Favorite dish to cook: It depends on the season! Chef Lev loves to cook with seasonal ingredients, according to what is fresh and delicious at the moment. Specialty: Creating seasonal dishes Favorite thing about teaching at Kitchen on Fire: Sharing his love of fresh California ingredients with the wonderful students at Kitchen on Fire! Growing up in a family full of chefs and kosher caterers in New Jersey, Mat Wertlieb has felt at home in a kitchen since childhood. He first fell in love with the unique culinary scene of the Bay Area while working an externship at One Market Restaurant in 2000. After graduating from the Culinary Institute of America, he spent a year and a half in Boston’s busiest restaurant, Grill 23, before the pull of Northern California’s food culture drew him back. He has worked for the past decade at some of the most successful restaurants in San Francisco and Berkeley, including Lark Creek Inn, Farallon, Lalimes, and Gather. Trips to Italy and Israel furthered his exposure and passion for the various cuisines of the world. Chef Mat now works part time at Gather restaurant when he is not teaching classes with the Kitchen on Fire team. Mike Kalanty is a local author and baking teacher. He directs the bread baking program at the California Culinary Academy and has initiated the artisan bread program at The Art Institute, both in San Francisco. He is the author of How To Bake Bread: The Five Families of Bread®, which was selected by Publishers Weekly spotlight on the top books of the year. His book was nominated as a finalist for “Best Professional Cookbook” by the International Association of Culinary Professionals and won the top honor as “Best Bread Book in the World” at the Paris Cookbook Fair. Gaby grew up in the Auvergne region of France with his twin sisters. He was fed by his mother’s cooking who always bought products from the farmer’s market and meat from the butcher. At six years old, Gaby received his first cookbook for Christmas. This fostered his excitement for the culinary world and so his journey to becoming a chef began. He spent his weekends in the kitchen, cooking with his mom, making jams, preserves, savory dishes and cakes. On Sundays, he and his dad baked loaves of bread for the week – walnut bread, olive-parma ham bread, etc. You will meet these chef instructors during your 12 week series.